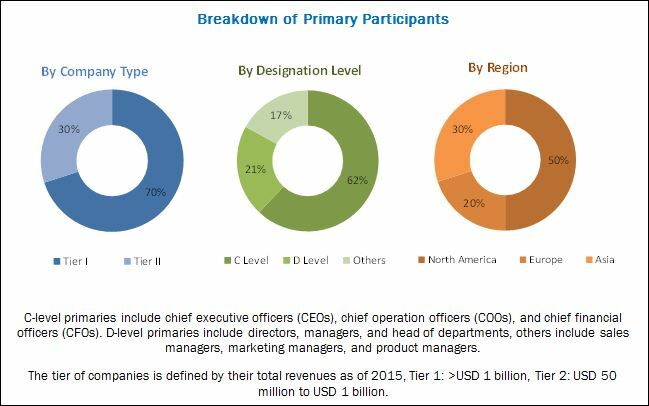 [227 Pages Report] The microbial identification market is expected to reach USD 3.00 Billion by 2022 from USD 2.04 Billion in 2016 at a CAGR of 6.6%. The base year for this study is 2016 and the forecast period is 2017–2022. The key players in the microbial identification include Becton, Dickinson and Company (US), Thermo Fisher Scientific Inc. (US), Danaher Corporation (US), bioMérieux S.A. (France), Merck KGaA (Germany), Charles River Laboratories International, Inc. (US), Bruker Corporation (US), Shimadzu Corporation (Japan), VWR Corporation (US), Eurofins Scientific S.E. (Luxembourg), GTCR, LLC. (US), QIAGEN N.V. (Netherlands), Liofilchem s.r.l. (Italy), IEH Laboratories & Consulting Group (US), Alcami Corporation (US), Biolog, Inc. (US), Abellon CleanEnergy Limited (India), Alpha Analytical, Inc. (US), NeoGenomics, Inc. (US), Trivitron Healthcare (India), Molzym GmbH & Co. KG (Germany), Dynatec Labs (US), Altogen Labs (US), STERIS plc (UK), and Wickham Laboratories Ltd. (UK). 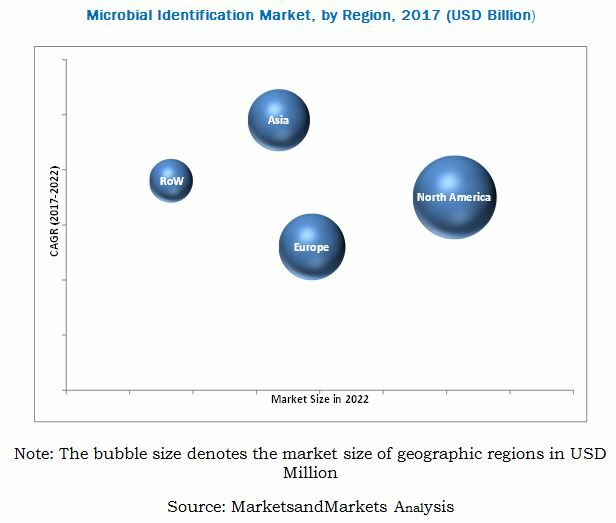 The global microbial identification market is expected to reach USD 3.00 Billion by 2022 from USD 2.18 Billion in 2017, at a CAGR of 6.6%. The market growth is primarily driven by the rising incidence of infectious diseases coupled with epidemic and pandemic outbreaks, increasing food safety concerns, technological advancements in microbial identification techniques, and government initiatives and funding to promote microbial identification. The global microbial identification market is segmented by product and service, method, application, end user, and regions. By product and service, the global market is segmented into instruments, consumables, and services. The instruments segment is estimated to account for the largest market share of the global market in 2017. Factors driving the growth of this segment include the extensive use of instruments and advances in technology to develop innovative instruments. By method, the market is classified into phenotypic methods, proteomics-based methods, and genotypic methods. The phenotypic methods segment is estimated to account for the largest share of the global microbial identification market. The large share of this segment can be attributed to features like cost-effectiveness, ease of use, and ability to deliver results rapidly which lead to their increased adoption across different end users. On the basis of end user, the microbial identification market is segmented into hospitals, diagnostic laboratories, and blood banks; food manufacturing companies; beverage manufacturing companies; pharmaceutical companies and CROs; and other end users. The hospitals, diagnostic laboratories, and blood banks segment is estimated to account for the largest share of the global market. Rising prevalence of various infectious diseases coupled with periodic outbreaks of pandemics and epidemics are major factors driving the growth of this end user segment. The global microbial identification market is dominated by North America, followed by Europe. North America will continue to dominate the global market in the forecast period. However, Asia is expected to witness the highest CAGR, with the growth in this market centered at Japan, China, and India. Factors such as the rising focus of major players in emerging Asian countries and government support are driving the growth of the microbial identification market in this region. The factors such as the high cost of instruments and complex regulatory framework for the approval of new microbial diagnostic tests may restrain the market’s growth to a certain extent. Major industry players launched innovative products to maintain and improve their position in the microbial identification market. Becton, Dickinson and Company (US), Thermo Fisher Scientific Inc. (US), Danaher Corporation (US), bioMérieux S.A. (France), and Bruker Corporation (US), Eurofins Scientific S.E. (Luxembourg) have been identified as the key players in this market. These companies have a broad product portfolio with comprehensive features and have also launched innovative products. These leaders also have products for all end users in this market, a strong geographical presence, and they focus on continuous product innovations. 12.6 Charles River Laboratories International, Inc.